Over the 14 years I’ve been running BellyBelly, I’ve connected with a huge number of parents and parents-to-be. I’ve read their countless stories and opinions – both for and against a range of topics. And, no matter whether I agree or disagree, I always listen – with curiosity and without judgement. There’s so much we can all learn, simply by listening. Vaccination is one of those topics. The ‘anti-vaccination movement’ is really nothing new; it’s been around for almost as long as vaccines. In the 1800s, there was public criticism of the smallpox vaccine. People objected for the same reasons as they do today, on the basis of scientific, religious, political and sanitary concerns. In Victorian England, in 1853, The Vaccination Act introduced mandatory vaccination of infants. There was immediate resistance. Parents demanded the right to control their bodies and those of their children. Anti-vaccination organisations were formed and anti-vaccination journals made an appearance. Today, there are many parents who have serious concerns about vaccination. Some might become involved in raging debates on social media, just like those who are pro-vaccination. But plenty of people behave very differently on social media than they do in real life. Introverts become extroverts, and those with social phobias feel safe and ‘let it all out’. A small percentage with hardline beliefs take extremist positions, at both ends of the spectrum. Many have poor communication skills, and because they are so outspoken, they become representative of their communities – even though they only represent a small percent. Most members of the community go about their lives peacefully, and quietly hold on to their beliefs. They prefer to remain private and not get involved in heated issues. Many parents who choose not to vaccinate don’t identify themselves as ‘anti-vaxxers’ (you’ll find out why a little further down the article). Either way, these parents are often misunderstood, misrepresented, and judged with a level of criticism unlike any other group of parents. They feel no-one will listen to their real concerns. They feel as if the whole situation is a dead end for them. All the while, the media portrays them as “dodgers” and “crackpots” rather than concerned parents. What would you do in the below parent’s sitution? Even the World Health Organization has a statement about adverse events with vaccines. “Adverse event following immunization is any untoward medical occurrence which follows immunization and which does not necessarily have a causal relationship with the usage of the vaccine. If not rapidly and effectively dealt with, can undermine confidence in a vaccine and ultimately have dramatic consequences for immunization coverage and disease incidence. So, why would I want to provide a voice for a group the media, the politicians and medical associations would rather keep quiet? I know plenty of genuine, loving people who do not vaccinate. They have legitimate concerns, but they are attacked and ridiculed simply because of their questions or doubts. The way most of the government and media respond to some of the gut wrenching stories is simply disgusting. They try to shut people down with hideous name-calling and aggressive behaviour and bullying. Those tactics never win any battles. Instead they turn concerned or fearful people into angry people who will fight for their beliefs. Nothing will ever change until they decide to listen. Maybe the reason they don’t listen is because once they do, they might realise they will have to do something about it. Recently, a mother shared her story after bumping into Australian Health Minister, Greg Hunt, who was speaking at an event. In the media, and in politics, only one side of the vaccine debate is represented. Journalists and politicians deny requests to facilitate a balanced debate. They refuse to meet parents – even if there is proof of vaccine injury by a doctor or hospital. Recently, an Australian politician called for the ABC to report on both sides of the vaccine debate. Sky News asked Senator Burston whether media organisations should air both sides of the vaccination debate, to which he replied, “Absolutely”. “I think any debate deserves equal weighting, irrespective of the topic, within reason, I guess”. “I think they are entitled to their view and perspective as well, and what they see as perhaps some immunisation of children not being appropriate”, he said. “I don’t share that view but I think they’re entitled to express that view”. The importance of hearing both sides was echoed by ABC News Breakfast presenter, Virginia Trioli, when discussing the flu vaccine. The media does a great job at creating division. They know it generates clicks, comments and views. The official media outlets have to find a way to stand out from the free media content we create every day, when we use our various devices to stream news stories and events. Their advertising dollars, funding and jobs are at risk. To survive in the avalanche of free media, they must present whatever is most melodramatic. In an article from the Sydney Morning Herald, titled, ‘Intense Targeting Of Antivaxxers Misguided: Most Undervaccinated Australians Are Adults, Experts Say’, an expert in communicable disease from UNSW’s School of Public Health and Community Medicine, Dr Menzies, was quoted as saying, “People love talking about vaccine-hesitant parents. The media and politicians love targeting them, but at the end of the day the numbers are not going to make much difference”. The heat is well and truly on right now, especially since some of the team from Vaxxed have just completed their tour of Australia. Sometimes governments survey the public about their vaccination beliefs. Usually, however, we don’t see the full results. Parents also complain that the questions don’t allow for an accurate representation of their position, or are not flexible enough to allow them to explain the reasons for their decisions and actions. I decided to survey parents who no longer vaccinate their children – or never have done – so you can see the trends among non-vaccinating parents, and how they think. I surveyed 217 parents, in Australia only. For a long time, we’ve been told those who resisted vaccination were the uneducated and poorer populations in society. According to the research, nothing could be further from the truth. Just recently, Channel 9 News ran a story that mirrored many other findings around the world: the biggest growth group for those who choose not to vaccinate are wealthier, university qualified professionals – even those in scientific fields. Vaccination rates in some of our wealthiest inner city suburbs of Melbourne are not improving – they’ve actually dropped to a level of 85%. Doctor Margie Danchin from the Murdoch Childrens Research Institute recently spoke with Channel 9 about the challenges of “educating the educated”. Of the parents I surveyed, how many had scientific or medical university qualifications? Almost 15% had a university-based science qualification: one was currently studying science. Just over 10% had a medical qualification; for example, as a doctor, nurse or midwife. A further three respondents were currently studying medicine. That adds up to a quarter of respondents. Research from 2009 found vaccination rates in higher-risk groups to be even lower than in the general population. Almost 60 per cent of professionals in medical or childcare roles opted out of their annual flu vaccine. Are The Parents Themselves Vaccinated? The latest research from the Medical Journal of Australia shows around 50% of Australian adults are unvaccinated. This figure is similar in the United States. In my survey, 85% responded with, “I was vaccinated in the past, but I stopped vaccinating and am no longer up to date”. A further 12% were partially vaccinated and almost 3% were fully vaccinated due to work requirements, but wouldn’t vaccinate otherwise. Only 3.7% had never been vaccinated. In nearly every vaccination debate, someone will play the Doctor Andrew Wakefield card. You’ve probably heard what the mainstream media have said, so if you are interested in hearing about all the major allegations, in his own words, you can see the clip here. So, did Doctor Andrew Wakefield influence the parents I surveyed? Is he the reason they stopped vaccinating? The leading response (69.3%) was, “No, I made the decision to stop, based on other sources”. A further 29.3% of respondents answered, “No, I made my own decision to stop based on a vaccine reaction in my family”. Parents are quite clearly not basing their decisions on Doctor Andrew Wakefield. The Natural News website has attracted a lot of negative media, and is often cited as one of the websites where ‘anti-vaxxers’ get their information. So, what did the survey respondents think of the Natural News website? Almost 50% of parents avoid it because they think it’s inaccurate and unreliable, or they just don’t like it; 39% said, “It’s okay”. Evidently, most parents do not rely on Natural News for all their vaccination research and information. Do They Think Vaccines Can Cause Autism? This is the age-old debate. Do non-vaccinating parents think vaccines can cause autism? Another train of thought parents have as to what may cause autism is the body struggling to detoxify itself, which may be from vaccination or other sources. The MTHFR gene mutation has several variants and is quite common. There are thousands of peer reviewed studies about MTHFR and how it impacts important functions and processes in the body. BellyBelly has an article on the MTHFR gene mutation, written by Dr Benjamin Lynch, about how MTHFR gene mutations may impact 1 in 4 pregnancies. The graphic below from Dr. Amy Myers is an approximate representation of what is believed to happen with each mutation. What Do They Think About Aluminium In Vaccines? A more recent concern about vaccines is the inclusion of aluminium as an adjuvant. An adjuvant is a component of the vaccine designed to stimulate the immune system to respond with antibodies. The reason for concern is this ingredient is a neurotoxin. It’s become so topical, a documentary called Injecting Aluminium has been produced. Are the parents I surveyed worried about aluminium in vaccines? Aluminium in vaccines “concerns me a lot” was the response chosen by 86.6% of respondents; 11.5% said, “concerns me quite a bit”. Another study helps to clear up the debate about injected aluminium compared to what babies naturally consume in breastmilk. 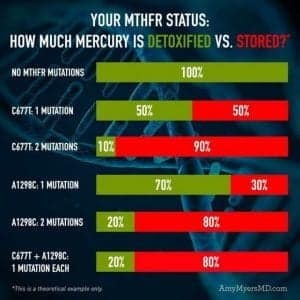 What Do They Think About Mercury In Vaccines? This is another big topic of debate, especially in Australia. In the past, thimerosol (from mercury) was used as an adjuvant. While it’s still in some vaccines in the United States, Australian authorities are adamant that vaccines in this country do not contain thimerosol. However, some argue that trace amounts can be found in some vaccines, and this is enough to cause damage. How Long Have They Been Researching Vaccines? I asked the parents how much time they had spent researching vaccines. The top results were: eight years or longer (39.6%); 2-3 years (12.9%); 3-4 years (12.9%); and 4-5 years (11%). How Strongly Do They Feel About Not Vaccinating? It’s been said that it’s very difficult to change an anti-vaxxer’s mind. So, how hard is it? I asked them how strongly they feel about vaccination. Are They Worried About Their Kids Getting Diseases? I asked the parents whether they were worried that their child(ren) would get diseases that are covered by the vaccination schedule. Do They Have Supportive Doctors? What Is The Worst Criticism They Have Received For Their Beliefs? Those who choose not to vaccinate tend to cop a lot of criticism – some of it serious. I asked them what they considered to be the worst criticism they had received. Around 39% found people to be judgemental sometimes; 38% had experienced strong criticism from friends and family; 13.4% had received abusive messages; and 4% had been threatened. Everyone calls them “anti-vaxxers”, but is that how they see themselves? Which Vaccine Concerns Them The Most, And Why? There is extensive media coverage about the MMR vaccine and autism, but is the MMR vaccine the most worrisome for parents? 15% said “other”, which mostly consisted of all the vaccines, followed by any combined vaccines. “All multi vaccines concern me greatly as I don’t have confidence that research has adequately explored the cumulative effects in sensitive/reaction-prone individuals”. “The terrible side effects being blatantly ignored and not linked to this vaccine [HPV vaccine] and the lack of research on the impact on people’s reproductive system. MMR is a very close 2nd because of the dramatic change that most parents have experienced in their children after having this. DTaP is 3rd because of the way in which pertussis [whooping cough] can still be passed on”. An article written by Doctor Neville Wilson contains many concerns about the HPV vaccine which are held by these parents. I want to finish this article with a story a mother shared about her frustrations. She informed me they had been trying to convince him for 20 minutes, and what he agreed to was to allow me to speak for five minutes, and then he would come on. I had to agree, as it was that or nothing. So I used my full five minutes, was able to answer all the questions, and was grilled by a very pro-vax presenter. Then Doctor Wooldridge came on and said I was the most dangerous person, and needed to have my children removed from my care. He then presented a lot of fear mongering that was not backed up by anything. Doctor Wooldridge replied, “Our research shows that when we give parents too much information, they will not immunise”. Finally, a MUST watch video, which would be the most important for our politicians to see, in order to hear a highly educated opinion on human rights. Professor Mary Holland was educated at educated at both Harvard and Columbia Universities (graduated with honours), and is now a Director of a legal skills program at the New York University School of Law. Speaking in front of the United Nations, she raises some very important questions which we should all be asking. Data/Proof: Those who are asking for proof and data, you can download the PDF here (minus the open-ended answers). I have not made any claims about the survey being strictly scientific. After being shown various government and university based vaccination surveys, I am also of the belief that even those who have a scientific education can possibly manipulate questions asked to get a desired result, or not know the right questions to ask, as mentioned in my article. Good article, Kelly. Thank you! What a fantastic article! Thank you for providing some good perspective and giving parents-who-don’t-vaccinate a voice! Thank you for your sense of balance. The world is feeling so unsteady at present. We need minds that are open and non-judgemental. Is it OK with you to use this article to prompt discussion at my work place? Be interested where you got the ethical governance from for this. Also how much training and background you have in scientific methodology? Scientific methodology is only taught at postgraduate level and only to certain groups of students. Thanks for your comment, G.
So, is what you’re saying that only post-grad students have the required skills to conduct a survey? Kelly, I was trained in the scientific method from my first year of a behavioural sciences honours degree – see here for a basics https://www.sciencebuddies.org/science-fair-projects/science-fair/steps-of-the-scientific-method – it’s not that onerous a concept to master, and super unprofessional to attempt to invalidate your content by questioning your processes without making an enquiry re the processes you used (however, apparent to me you used a fairly simple and easy to complete questionnaire – perfectly acceptable scientific data gathering tool). Usually the raw data can be made available and also the questionnaire for those more curious in the scientific process. However, the real relevance here is actually that you did not set out or claim to be conducting a scientific experiment, although in my opinion you followed some of the key steps, yet you and the results you obtained have been slandered by attempting to label both as unethical and unscientific – serious? That’s like me saying you are not a [fill in the blank with any noun] so therefore your data and approach are invalid – now that is unscientific and unethical!! Hmmm. Not sure is you are trolling or can’t remember a standard science education from high school… As a matter of fact, the scientific method is taught in year 8 in Australia. At least in Victoria anyway, where kids are taught to observe, and to report upon their findings (through observation). The scientific method has characterised natural sciences since the the 17th century (the 1600’s), which consisted of systematic observation, measurement, experimentation, formulation, testing and modification of hypotheses. Experiments need to be designed to test hypotheses. Experiments are an important tool of the scientific method… so even by that definition (Oxford Dictionary btw) it doesn’t require having a post doctoral degree. Seriously, ethical governance is a really huge field. So big that people need to sit down and cry. Where to begin… Most governments don’t usually put the two words together because it creates a really big word called a “contradiction” between statements and actions. What they do have are Governance attributes where ethics are a part of the principals. They need to be principals because ethics are even more subjective than principals themselves. … and others values which are a must, for the attainment of ethical governance… can you see the “contradiction” already? Why (in-case you can’t)? Because ethical governance is a panacea for corruption. I’m not sure where you were educated as a child but in America we begin learning the scientific method from grade school on through high school and use it even in basic science courses at any liberal arts university. You don’t have to be in a post graduate program to learn the scientific method. That’s absurd. This is the funniest comment I have read in a long time. Simce when does one need “ethical governance” to ask people questions and report their answers? Perhaps that’s why the media refuses to speak to pro-choice ex-vaxxers, they don’t have post-graduate training in the scientific method or “ethical governance” to ask them questions. You MIGHT have an argument if this “mommy blogger” had made any claim that she was reporting scientific results, but as she didn’t your pomposity is beyond ridiculous here. What a great initiative by Kelly, especially when there is not a single scientific study comparing the vaccinated to then un-vaccinated. And interesting to see that those who are the most concerned are highly educated and from higher income areas. This was such a refreshing article to read. Those who don’t vaccinate just want to be heard istead of being ridiculed and the more we are silenced the more I know I definatley made the right choice not to vaccinate. It scares me that the government wants to control the decisions of parents who only want nothing but the best for their children. I have worked in the education system for 25yrs and the ratio of children on the spectrum in the classroom has raised dramatically, why do they NOT want to find out why this is.? Our future relies on our children and grandchildren and if nothing is done what a very sad place our planet will be. Yes, and diagnostic measures are set to improve even further! In 1990, around 1 in 10000 children were on the spectrum. We’re currently at 1 in 63 & it is estimated that will increase to 1 in 2 by 2032. Think of the thousands of poor children who missed out on a diagnosis in 1990.
selective job cuts at abc? Thank you for such a balanced article. I cannot tell whether you vaccinate your own children or not from this and that is how it should be. Well done. So, parents who are vaccine-hesitant are supposed to talk with their doctor to help them alleviate their concerns? So what exactly is a doctor expected to do to change these well-educated and well-informed parents minds? Lie to them that vaccines are safe? 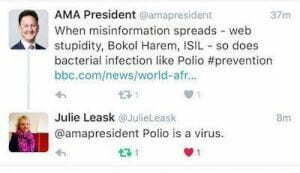 Once one realises that vaccination is a medical fraud and child abuse there is no going back to believing the lies we are being told. As far as I am concerned, vaccination rates of over 90 percent are appalling, and even vaccination rates of 85 percent are still way too high. Zero vaccine uptake would in my opinion be far better, especially as it would cause the vaccine industry to go belly up, something which is way overdue. Vaccination in my estimation needs to be abolished as a matter of urgency to once and for all put an end to this organised criminal enterprise dressed up as disease prevention by means of junk science. 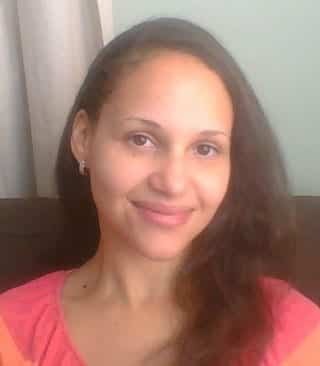 Love your message Stephanie and am feeling empowered by your quote. I went to your website (linked) and read your story knowing I would bawl my eyes out. My heart broke for the journey you went through with you son and it is absolutely devastating you are not alone in your experience. You are right. We cannot be complacent. We must make a stand and fight for our fundamental rights. We will win for our future generations ahead of us. Oh Stephanie – I just read your story and I want to thank you and your first born from the bottom of my heart. I have a 12 week old and I was pretty sure of my decision not to vaccinate but when you become pregnant suddenly everyone has an opinion and those opinions get louder when the baby arrives. The last shred of doubt about my choice has left my being after reading your story. Thank you for continuing to educate people 30 years on! Thank you for standing up! What you’Ve done by sharing this article is a truly courageous act in this day and age, considering how biased on corrupt the media is. Keep up the good work! Truly appreciate the time, thought and effort made in piecing this article together. It really is a breath of fresh air to know there are people out there who are willing to take the time to look past this misrepresentation of who we truly are and see the big picture. Thank you for shining a more honest light. Here’s another Ghandi quote: Vaccination is one of the greatest delusions of our time. This is such a fine article, but anyone who’s devoted time to sober study of vaccines recognizes that there really is no debate. There’s a string of outrageous falsehoods from the establishment – the most prominent being, vaccines are safe, when in reality any vaccine can permanently disable, even kill a child, with no way known to accurately predict the probability – which are forwarded unquestioningly by the mainstream media; and a large, expanding group of concerned parents, doctors and other medical professionals, investigative journalists, researchers and scientists who ultimately realize not only the falsity, but its depth. Vaccination is the injection of disease antigens, known neurotoxins – which are by definition poisonous – carcinogens, blood-brain barrier disruptors and other noxious ingredients, none of which belong in the bloodstream, and the reason such a procedure doesn’t sound like a rational approach to disease prevention, or better health in any fashion, is because it isn’t. Very well written piece. My mind was made up years ago but nice to see some factually based articles that aren’t just preaching to the converted. Did you know that the Australian government actually deported Polly Tommey, a member of the Vaxxed documentary team? Well done! A thorough and balanced article for a change!! Bravo! This was a really well written article especially in its ability to remain neutral and let the facts do the talking. The mainstream media are no longer writing balanced articles like this re vaccination and many other subjects. It’s also ironic that Bellybelly had to do their own survey! This type of survey should have been done by government and or the flagship media…but of course they are hesitent of doing a survey like this because they are scared of the results! They want to control the conversation and not the other way around! Thankyou for showing that we arent crackpots. We love our children like everyone else. Great article, very balanced, brave and informative. I find this debate very disturbing but education or lack thereof and unbiased information seems to be a big part of it. I am pro-choice and fully vaccinated my first child but after discovering my husband and I both have homozygous Mthfr we have done a tremendous amount of research and will not be vaccinating our second child, the negative health implications are just not worth it. We’re definitely not uneducated hippies as the current anti-vax stereotype would suggest! Thanks again. Our affluent western society has extraordinarily low levels of infant mortality, compared to any other society now or in the past, and vaccines (along with sanitation) are one of the main reasons for that. Adverse reactions, and in particular serious ones, are very rare. In unvaccinated populations, diseases such as polio and whooping cough are far less rare, and cause permanent damage and death. Parents who choose not to vaccinate are benefitting from the still-high rate of vaccination in our society, which makes the chances of infection remain low. With every child that goes unvaccinated, every child’s chance of infection by a deadly disease goes up. Thank you for writing this. It accurately reflects what parents of vaccine injured children have had to deal with. 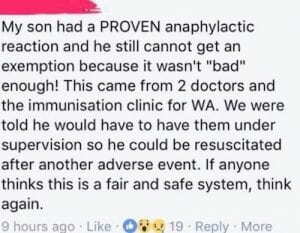 I love the comment where the parent explained her child couldn’t get a medical exemption despite a previous serious adverse event and she said “if anyone thinks this is a fair and safe system, think again”. That is the situation with my child too. He nearly died from seizures that began after the DTaP vaccine (seizures that have been associated with pertussis containing vaccines for decades now), and he still takes medication to control seizures, but he only qualified for an exemption to the DTaP, not to any other vaccines. I’m supposed to further risk his neurological health by experimenting and giving him more vaccines. So many people lament that vaccine rates could lower if we start talking about the serious adverse events caused by vaccines honestly and transparently. That may very well be the case. But right now we are trading potential complications and death from illnesses for complications and death from vaccines, and that is not a fair trade off – certainly not for the thousands of parents whose children’s lives have been derailed and who never agreed to be the “sacrificial lambs” for the rest of society. At the very least, there should be a huge focus on doing quality research that includes as many of the vaccine injured as possible, to determine what factors this group has in common, with the goal to pre-screen in the future and prevent these tragedies. As was mentioned in the article, the MTHFR gene mutations seem to come up quite a bit in vaccine injured circles, so perhaps that should be a research focus.